Whenever I see pears, my first thought is that they would be fun to paint. 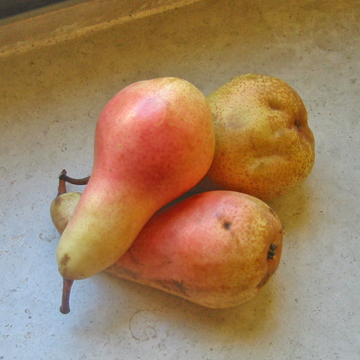 The pears at the market are seven inches long, with pale yellow, almost ivory, skin and a pink blush on the sunny side. I have sliced them into fruit salads and served them with yogurt. I sauteed the cored and thinly sliced, unpeeled pear and apple in a tablespoon of butter over low heat until the fruit was tender and beginning to brown. That’s it! No salt, no sugar, no spice. 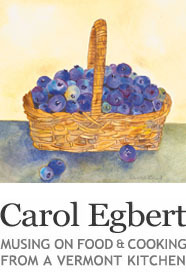 As the fruit cooked, it filled the air with a flowery perfume. When I went back to the market and asked the vendor what kind of pear it was, he said “Italiano,” with a smile and a shrug. I found more information on the Internet. The pear with the pale skin and sweet perfume is an Abbe Fetel pear described as a large fruit, with melting whitish flesh, very juicy and aromatic, that originated in France in 1866. So, it’s not an Italian pear at all, but a pear worthy of a cordon bleu. The Abbe Fetel pear may not be sold in markets at home but many varieties of pears are, and that puts warm pear and apple salad in the can be recreated category.